Program MKR Over-the-Air + Goodies: Voice Control, etc. Secure OTA via Azure. Control via voice capable UWP app. Includes sample: room thermostat controlled via phone. This is needed for every OTA projects. The components below are needed only for the use case / sample: the room thermostat. Our contribution has 2 parts. 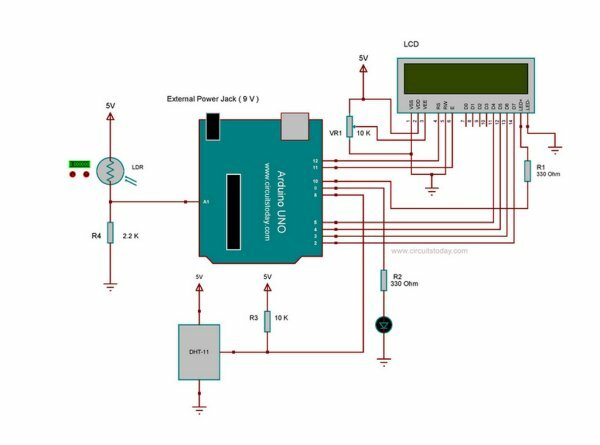 Over-the-Air (OTA) programming of the Arduino MKR1000 (i.e. uploading the compiled binary code). Several methods are available: e.g. from within LAN or from Internet, securely, via Microsoft Azure IoT Hub. Universal Windows Platform (UWP) client app, with a nice user interface. 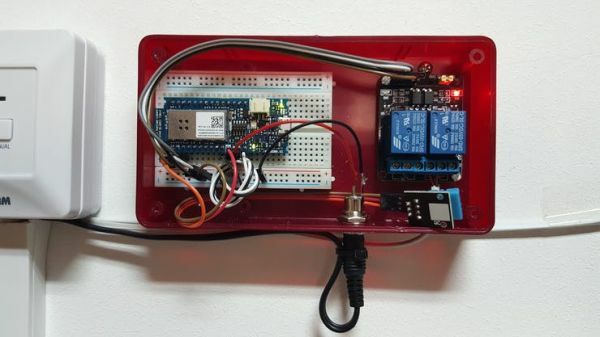 It communicates securely with the board via Azure IoT Hub. 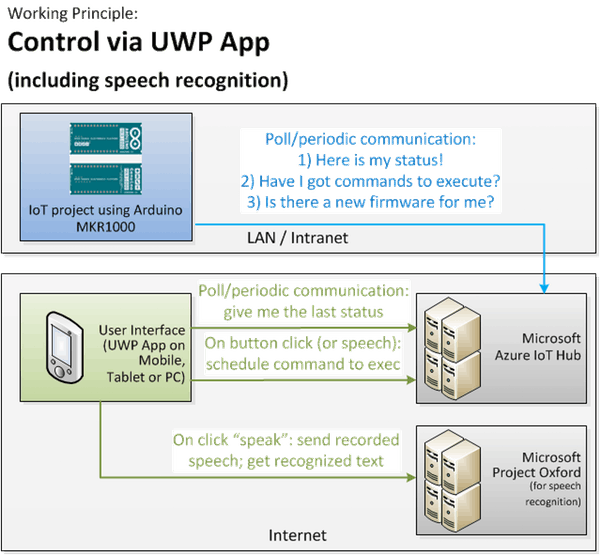 Voice recognition (on the client app), via the Speech Recognition API provided by Microsoft Project Oxford. 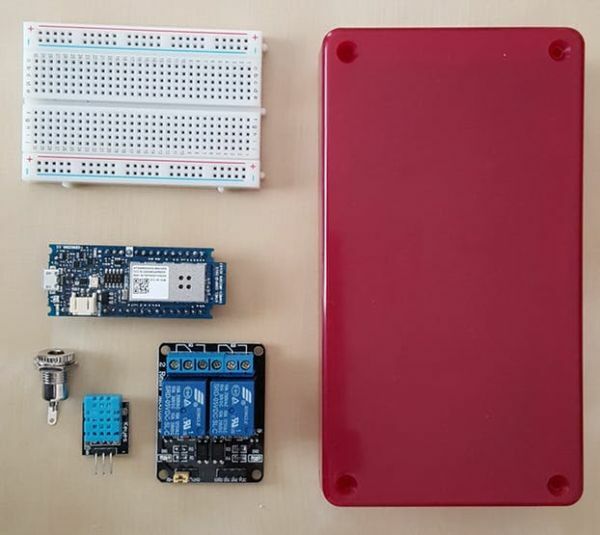 Spoken commands can be used to control the board via Azure IoT Hub. 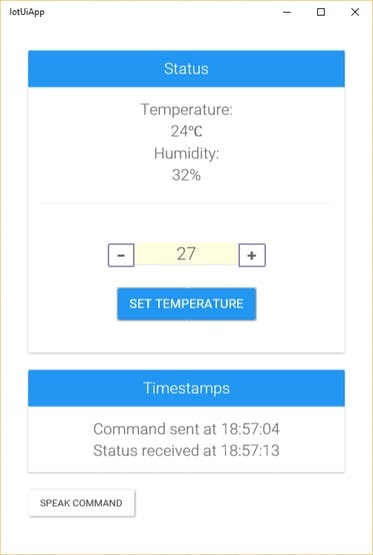 Part 2: An use case / sample, built with the above components: a room thermostat, controlled via phone (UWP app). We have built it to serve as an example of how to use the components. And we went even further: we have installed it in our office, and as we are writing these lines, the office heating system is controlled by this very project. NOTE. Besides the BLUE method and GREEN method, we also provide an intermediate one: send download signal cf. BLUE method and download cf. GREEN method. a run-time library. It handles the firmware upload and copy mechanics. a custom “boards” package. It has a few linker related settings, needed by the library. an Arduino IDE plugin. It sends download signals and compiled binary sketches (a.k.a. firmware). 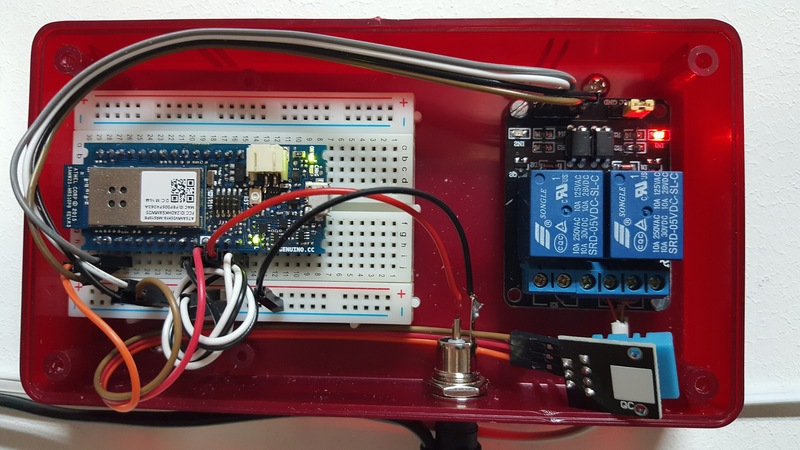 It communicates with the board, Azure IoT Hub, the IoT dispatcher server app (cf. below). IoT Dispatcher, a PHP + MySQL application that stores and serves firmware. An UWP client app, written in C#. 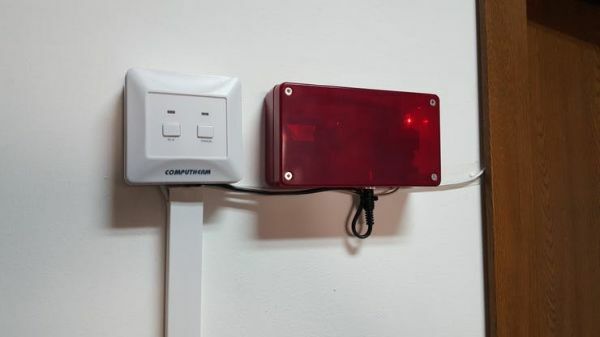 It communicates with the board via Azure IoT Hub, and recognizes spoken commands via Microsoft Project Oxford. It can be used as starting point for various projects. 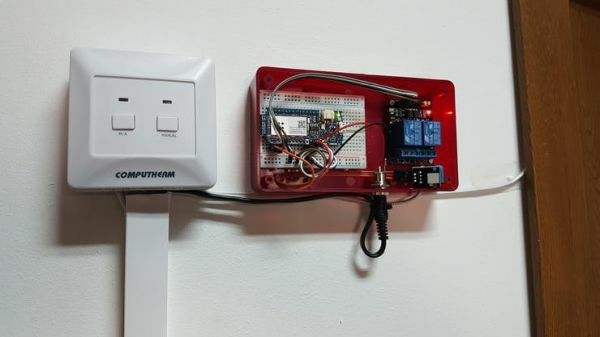 As mentioned before, we developed the room thermostat to demonstrate how one can combine our components to build a real life project. In our case, we even put it into production, i.e. it controls the heating of our office. User interface of the UWP App. Left: the original thermostat. Right: our awesome thermostat. We don’t provide a Fritzing diagram, as we use a Beta MKR1000. Pin layout may change in the future. Download and unzip some libraries in: SKETCHBOOK_DIR (e.g. 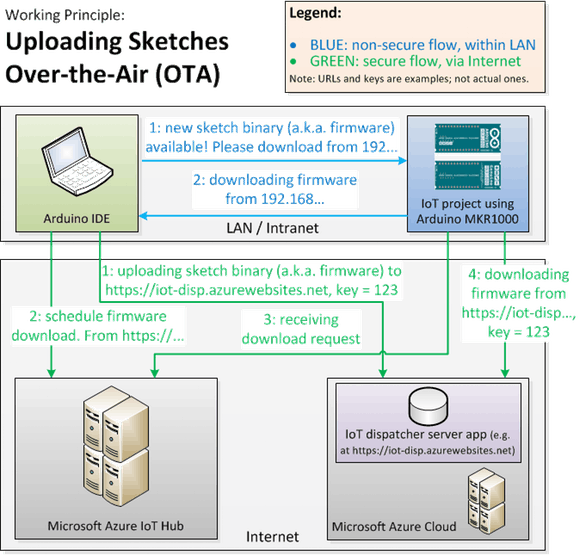 Documents/Arduino)/libraries: WiFi101, AzureIoT, RTCZero. Download and unzip the OTA run-time library in: SKETCHBOOK_DIR (e.g. Documents/Arduino)/libraries. Download our custom “boards” package. Create a directory: SKETCHBOOK_DIR (e.g. Documents/Arduino)/hardware/flower-platform. Unzip the downloaded file here. Download the Arduino IDE plugin. Create a directory: SKETCHBOOK_DIR (e.g. Documents/Arduino)/tools. Unzip the downloaded file here. Download IoT Dispatcher and install it on a PHP + MySQL server. E.g. we have instructions on how to deploy in the Microsoft Azure Cloud. There are 3 OTA upload methods. and (cf. the “server signature” from the popup window). NOTE: for all the 3 methods, you need to do an initial upload via USB. After that, you can continue to use OTA, with the method of your choice. 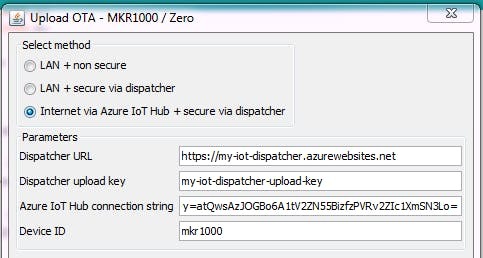 3) Try OTA via secure dispatcher + Azure IoT Hub. File > Examples > Arduino-FlowerOTA > WiFiOTA-AzureIoTHub. Again: don’t forget to adjust the lines commented with “// CHANGE ME“. 4) Try the use case / sample: the room thermostat. It’s available here. The UWP project is available here. Visual Studio 2015 and Windows 10 are needed. This code can serve as starting point for client apps for various project. You only need to adjust the user interface according to your project. Boards such as the Arduino MKR1000, that have reasonable processing power and SSL communication capabilities, represent a huge step forward for the community of makers. Leveraging the Flower Platform, we plan to create a foundation that will focus on teaching young children to make and program IoT projects. Source : Program MKR Over-the-Air + Goodies: Voice Control, etc.